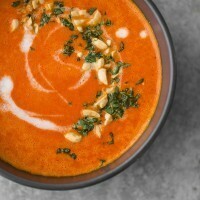 Thai Curry Red Pepper Soup | Naturally. It may be officially fall by the calendar date, but there’s two strikes against it feeling completely like fall in Northern California: the temperature is supposed to be in the 90’s today and summer produce is still everywhere (which I’m okay with, I like my sweet potatoes but we have many months to enjoy them!) This summer, I’ve fallen in love with a man named Jimmy. Don’t worry, M knows about this love and while he thinks it’s weird, doesn’t find it threatening. It also helps that the Jimmy I fell in love with is a variety of pepper, not the actual man (even though the pepper is named for the man). 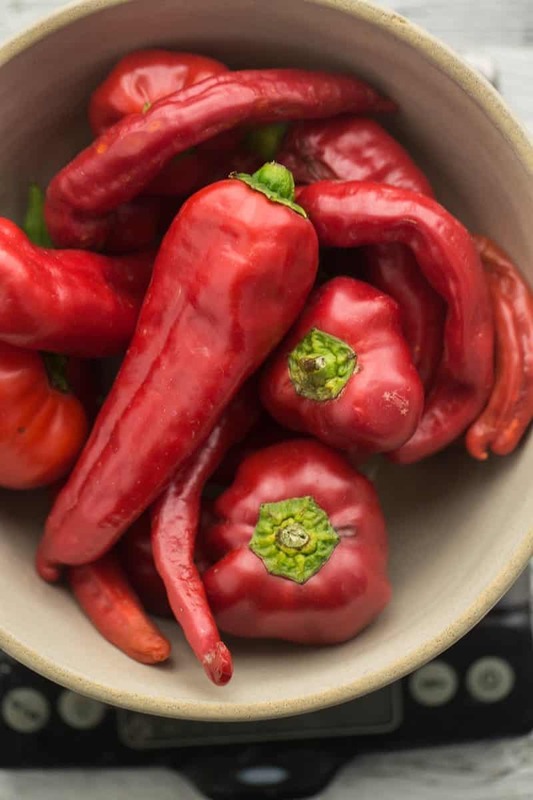 Jimmy Nardello peppers are a sweet Italian pepper and the flavor goes above and beyond the red bell pepper. I’ve always been a fan of the Italian peppers over the bell peppers, but this pepper sealed the deal. If you’re curious, you can learn a bit more about the man and the pepper here. 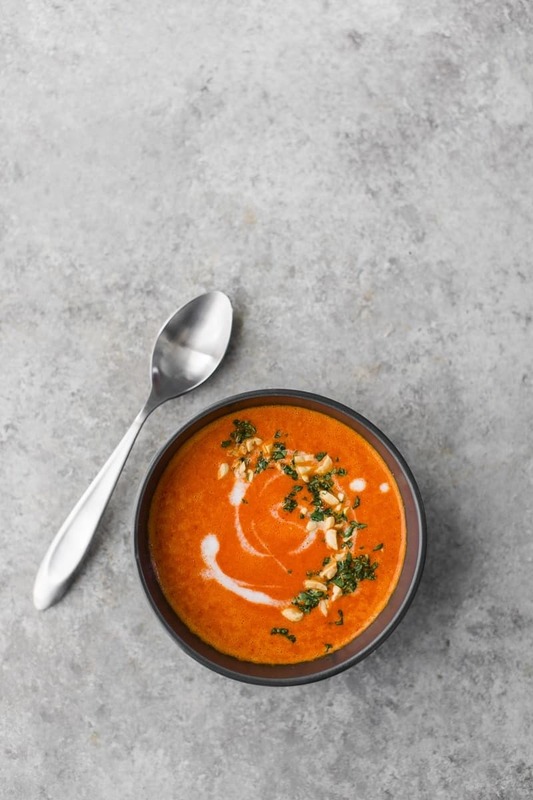 I’ll start by saying that you can make this red pepper soup with red bell peppers, the flavor of the pepper will not be as strong (which is okay, it’s still quite a flavorful soup with the curry paste). 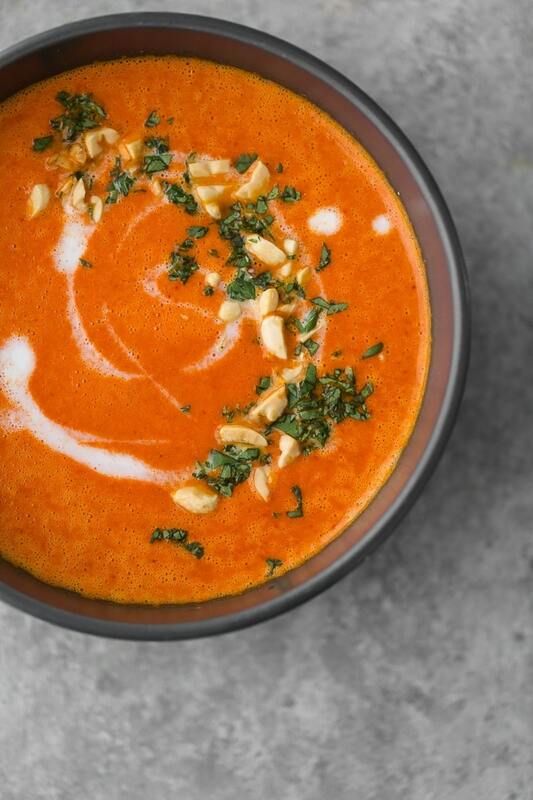 However, if you’re at the farmers’ market this weekend and see anyone selling sweet red peppers, grab them, roast them, and turn them in to this red pepper soup. I’ve kept this soup easy, with minimal ingredients. I buy pre-made curry paste and really rely on that for the flavor. Some curry paste are hotter than others, so use your best judgement if you buy a brand that has some kick to it. I’m also going to suggest keeping the pairings light with this and making Anna’s Cucumber Satay Crunch Salad. The heat from the soup works extremely well with the crispness of the cucumber. Preheat oven to 425˚. Remove the stems and as much of the pith/seeds from the peppers as you had. Cut them into large chunks and roast for 20 to 25 minutes until the peppers are tender. 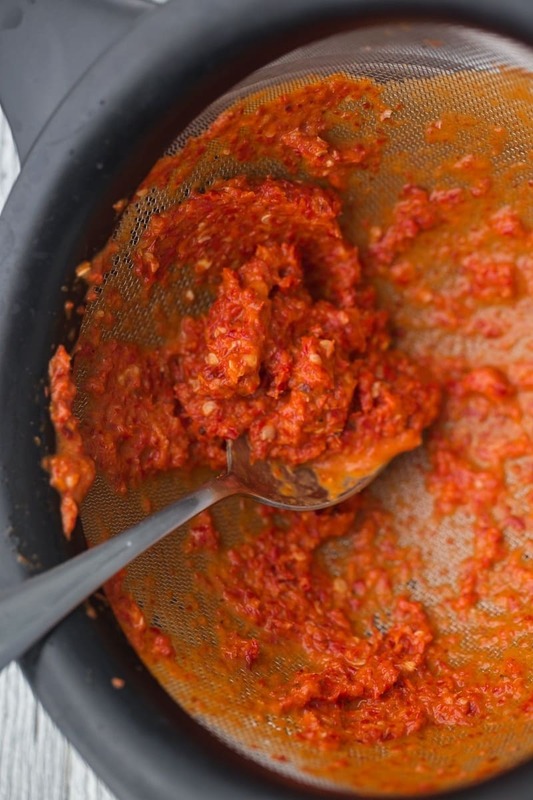 Place the peppers in a blender along with the curry paste, vegetable broth, and coconut milk. Puree until all the mixture is mostly smooth and blended. Pass the mixture sieve into a pot, pressing out as much of the liquid as you can. Reserve the leftover mixture to spread on sandwiches or eat with eggs. Heat the pot over medium heat until the soup is hot. Taste and adjust the seasonings/thickness as desired. Divide soup into two bowls and top with a drizzle of coconut milk and a sprinkle of peanuts/cilantro. 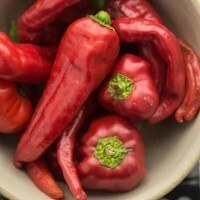 + As mentioned in the post, I used a mixture of sweet red peppers including Jimmy Nardello. Red bell peppers work as well but the flavor might not be the same. You can also use roasted red peppers with the skin removed. + Many of you have asked about the curry paste and while you can make your own, I usually pick up this variety at the store. If you’re looking for a heartier soup, cook a batch of red lentils ahead of time and add 1/2 to 1 cup to the blender when pureeing the soup. You might also want to add a bit more vegetable broth to thin the mixture down so that it can pass through the sieve. This soup looks so incredibly delicious and simple to make! Thai curry is so amazingly versatile ! Thai food’s so delicious. I really like it. The colour of that soup is just stunning! I always forget that I love roasted peppers – this has just rekindled the flame! Roasted peppers are sooo good. I think this soup is pure perfection! Any idea of approximately how many Jimmy Nardello peppers would make up 2lbs? My CSA has had them weekly, but I don’t have a scale! Hi Emily, Oh gosh- I’m not 100% sure but I think an average pepper weights between 1 and 2 ounces, so you’re probably looking at around 16 to 24. Hope that helps! This soup sounds amazing and perfect for the fall weather over here. Definitely adding this to my menu plan this week. Thanks for the recipe. I made this today with a couple adjustments. I use one and a quarter pounds of red bell pepper and I added one cup of cooked red lentils as suggested in the notes. For the coconut milk I used homemade. I used the rest of the ingredients as listed but I did not pass the soup through a seive when completed. I just put everything in the blender and I am saving it for Tuesday nights dinner. The color is not as vibrant ( mine is more orange than red) but it is a really tasty, then my 18 month old ate two bowls of it before I put it away. I know I took a lot of liberties with the recipe but thank you for the inspiration I will make it again! I’m so happy to hear that it turned out and I love it when people have success just using a recipe for inspiration! I really love the lentil addition, makes the soup that much heartier! hello! looks great… only question is, why would you add the lentils to the blender instead of directly into the soup? I like to use lentils as a thickener and keep the soup relatively smooth but if you just want whole lentils, you could add it after pureeing the soup mixture! gottcha.. both ways sound great. think ill try making this on my day off wednesday 😛 also on the fall menu is the butternut squash and black bean tacos from your site!